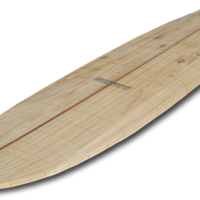 The dropped deck VLZ 14’ x 23” is a race board for those paddlers wanting the very fasted shape available in strip planked hollow wood construction. 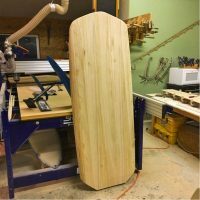 This is a very cutting edge design with a highly refined bottom shape which will product a fast and stable board for it’s 23” width. 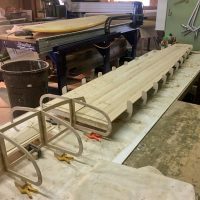 This is a board that is best suited for experienced builders and paddlers and is designed for primarily flatwater paddling. A major “takeaway” so far from 2018 is that much is changing quickly in both touring/racing shapes, and in the surf scene, with the influx of foils, where both prone paddle and standup paddle surfers are now flying foils. An upside to learning to foil surf is that some otherwise un-rideable surf is now available to be ridden and is desirable in many ways. Slightly onshore or side shore winds are much less of a negative once the foil is flying. Although we haven’t “officially” launched our new foil specific board line up, it’s easy to see the direction foil boards are moving in terms of size….smaller is the key word here….the smaller the better. Of course, you still need to be able to paddle the board and foil, into a wave, so there is a practical limit to how small of a board any of us might be able to paddle.